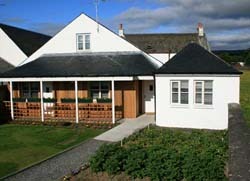 Hillhead Farm Lets provide three luxury rooms which have been converted from a traditional Scottish farm steading. The rooms have been finished to a very high standard and are set around a traditional Scottish cottage garden with panoramic views towards Stirling Castle, the Wallace Monument and the Field of Bannockburn. We are located in the countryside close to the historical town of Bannockburn, within walking distance of the Bannockburn Battlefield site where Robert the Bruce defeated the English armies in 1314. Our rooms all have en-suite shower rooms with top quality bed linen and towels. We also offer free high speed broadband and have wall mounted Freeview flat screen televisions. We also have complimentary tea and coffee. We offer room only, but we are situated less than fifty yards from the Pirnhall Brewers Fayre who supply fine food and drink. We are situated at the edge of Bannockburn, less than 5 minutes from Stirling. Our rooms are perfect for business stays or for holiday accommodation. We have double rooms and a family room. Our prices can be negotiable depending on the time of year and how many people are sharing the room etc. We are surrounded by Scottish history. We are also ideally located for golfing breaks and there is over 60 top quality golf courses with one hour's drive of our location. Book now for a short stay in our luxury self catering accommodation. We are less than a minute from motorway links to Glasgow, Edinburgh, north to Perth and the Scottish highlands. We are 30 minutes drive from Edinburgh Airport and 45 minutes from Glasgow Airport.